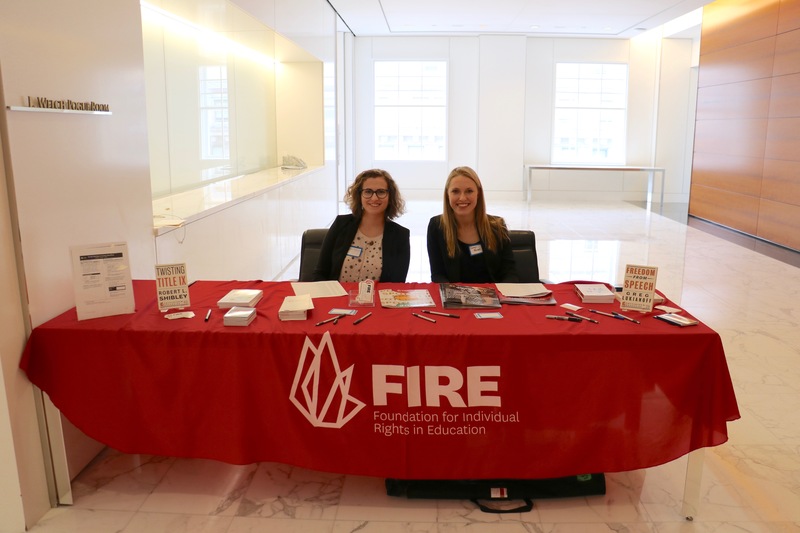 On Monday, FIRE and nearly 90 supporters and friends gathered at the Jones Day law firm’s rooftop to celebrate the launch of FIRE’s First Amendment Library. 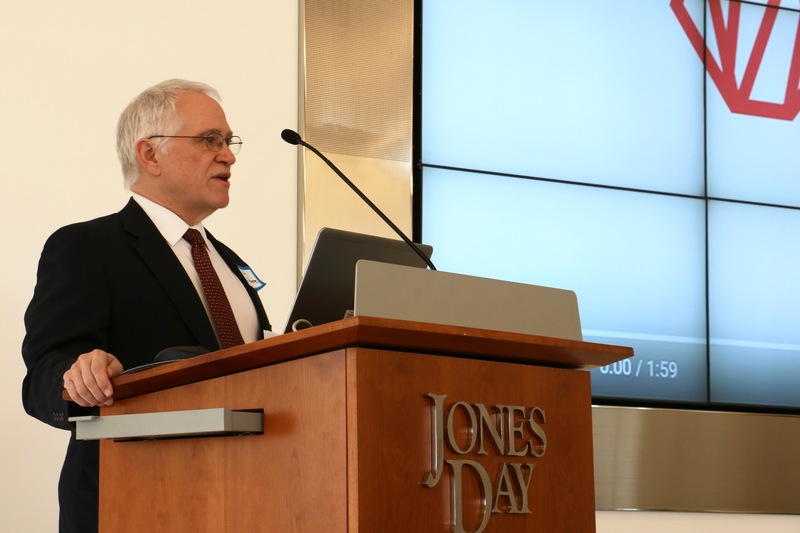 Originally the small passion project of First Amendment law scholar Ronald Collins, the library is now designed to be a premier resource for information about the First Amendment’s five freedoms. The library contains a growing database of more than 900 First Amendment-related Supreme Court opinions, historical material, and special document collections you won’t find anywhere else. FIRE President and CEO Greg Lukianoff welcomed attendees and acknowledged those whose efforts and support made the First Amendment Library possible. This included the library’s 15-member board of advisors, the Stanton Foundation, and Collins, among others, with a special thanks to FIRE’s Executive Director Robert Shibley and his assistant, Jackie Farmer. Attorney Bob Corn-Revere told attendees that FIRE’s First Amendment Library will help bring free speech jurisprudence to life. Bob Corn-Revere, a partner at the law firm of Davis Wright Tremaine and a leading expert on First Amendment law who has worked extensively with FIRE’s Stand Up For Speech Litigation Project, took to the podium to offer his remarks on the library as a valuable resource not only for students and the general public, but also for practicing attorneys. The First Amendment Library, he said, is not a typical database but a “comprehensive body of knowledge” bringing together news stories about the First Amendment, information on the advocates involved in First Amendment cases, case law, briefs, scholarly articles, popular articles, and more. First Amendment law isn’t just the cases. It isn’t just the math, where you look at cases that have a certain “test,” and you say, “okay, let’s plug in the facts of this case” and see what you get at the end of the equation. First Amendment law is about the stories that we live. These cases are about flesh and blood individuals, and you have to look at a comprehensive database—like the one the First Amendment Library has brought to life—to understand what those stories are. He also gave a brief demonstration of how visitors can make use of all the features the First Amendment Library has to offer, highlighting search functions that allow users to browse the collection by topic (Freedom of Speech & Expression, Religion, the Press, Assembly & Petition, Association, and a special section devoted to “Cases on Campus”), hone in on specific subtopics (such as “Picketing,” “Electronic Media,” and “Gag Orders”), or locate cases from a specific year. Additional features of interest include an interactive timeline of the history of free speech, transcripts from the obscenity trials of comedian Lenny Bruce, and a collection of papers from Eugene Volokh, a member of the First Amendment Library’s Board of Advisors and an accomplished law professor and scholar. FiRE’s Jackie Farmer and Carolyn Hansen welcome attendees. If you believe in the First Amendment, if you believe there’s a place in your world to defend ideas with which you disagree—and to defend ones with which you agree—then the First Amendment is a vital part of your life, be it freedom of speech, press, petition, assembly, or religion…We can never have enough folks defending our five freedoms.